A less-than-charitable cartoon of Augusta Webster's "A Castaway." 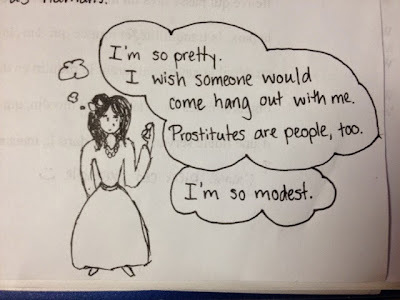 It's about the life of a Victorian prostitute. I wish I could be more specific, but the poem kinda goes all over the place. It's a dramatic monologue, and the speaker, Eulalie, is talking to herself about... well, her life.